Celebrate Halloween with the perfect balance of pumpkin and pumpkin pie spice. These cakes are moist, delicious and simple to make. 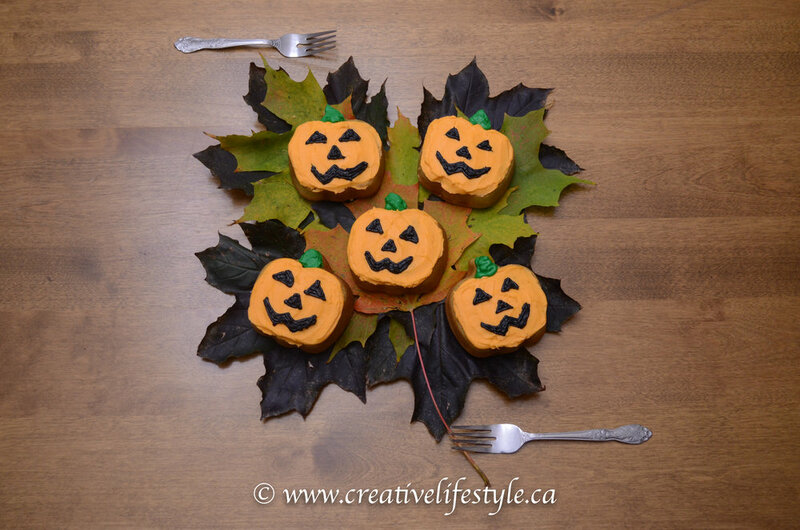 These cakes are simple and made with a Wilton Miniature Pumpkin Cake Pan that can be purchased here. In the bowl of a stand mixer fitted with a paddle attachment cream together the butter and sugar until light and fluffy. Once light and fluffy add in the eggs one at a time mixing between each addition. Next add in the vanilla and pumpkin puree and mix until combined. In a large mixing bowl combine flour, salt, baking powder and pumpkin pie spice. Next add 1/3 third dry ingredients to the stand mixer mixing well. Then add half of your milk and mix. Next 1/3 dry and mix. Finally, the other half wet and mix well and then add the final 1/3 dry. Spray your miniature pumpkin cake pan well with cooking spray. Fill each pumpkin cavity about 2/3 full with batter. Bake 15-22 minutes until a toothpick comes out of the centre clean. Allow the cakes the cool completely. ** If you're using the same cake pan that we have chosen to use to level your cakes simply take a serrated knife and gently cut across the top of the pan and the cakes will be perfectly level. In terms of decorations you can use anything you would like we have chosen to go with a classic vanilla buttercream.